Date limite pour l'inscription aux auditions. RapSohD's 3rd annual performing arts competition final, Living the Dream took place on Sunday, May 25, 2003, at the Pierrefonds Cultural Centre, 13850 boul. Gouin West. City Councillor Bert Ward attended on behalf of the Borough of Pierrefonds/Senneville. The production - directed and staged by and with thanks to Christopher Lester, Director of Theatre and Music at John Abbott College (JAC), Ste-Anne de Bellevue - provided an afternoon of excellent talent and entertainment. 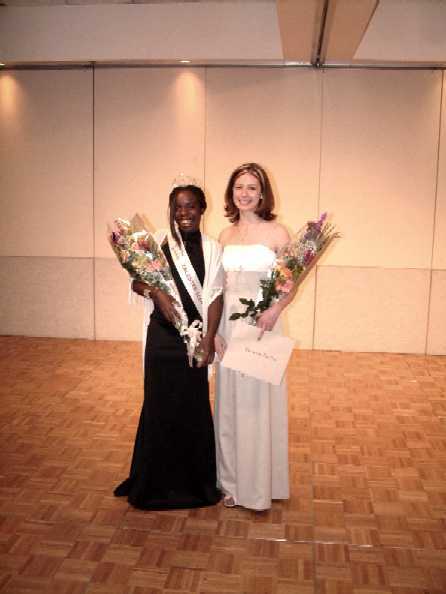 From the opening remarks by emcee Mahalia Verna, followed by the processional strains of Pomp and Ceremony 1 up to the final victory walk of Miss Talented Teen Canada 2003, the audience was engaged. The programme for the afternoon was divided into two sections between which there was a brief intermission. The competition, presented in two segments during the first half was interspersed with performances by invited guests. The first segment of the competition was based on appearance and personality. Wearing formal attire the young ladies, did a stage walk before introducing themselves in a speech no longer than twenty seconds. The second segment was based on talent of which the performance had to be 2 minutes or less. Here again the contestants lived up to the expectations of the audience, family and friends, exhibiting confidence as they delivered great performances that included dancing and singing, one being a self-composed song that was also self-accompanied on piano. Each contestant had the possibility of receiving from each judge a total of 65 points broken down as follows: Appearance 20; Personality 15 and Talent 30. Guidelines for ratings (AV, GD or VG) are provided on each prescribed form. The accountants responsible for tallying the ballots handed in were Wendy Davidson and Louis Soochan. The judging panel included: Marcia Bailey, (Choir director, Union United Church, judge 2002 Juno Awards): Dr. Clarence Bayne -Past President BTW, Assoc. Professor, John Molson School of Business, Concordia University; M. Georges Buteau - Bassist, Jazz & Blues musician, member of Ethel Bruneau School of Dance; Elaine Heitner - Music Appreciation, Computer Science- Dawson College; Jacinta Luis - Composer, performer, Chairperson Dawson School of Music. Shortly following the intermission there was a dance routine presented by the contestants and Melina Soochan RapSohD's 2001 winner that was choreographed by student volunteer Coralie Heiler (JAC). In addition to the high quality of the performances given by the participants during the competition, were those featuring invited guest artistes all of whom donated their time and talent to the success of this project. It was a pleasure to welcome among them, past winners and runners-up who by accepting the invitation to share their skills, demonstrated their appreciation and thanks while empathising with the objectives of the organization. 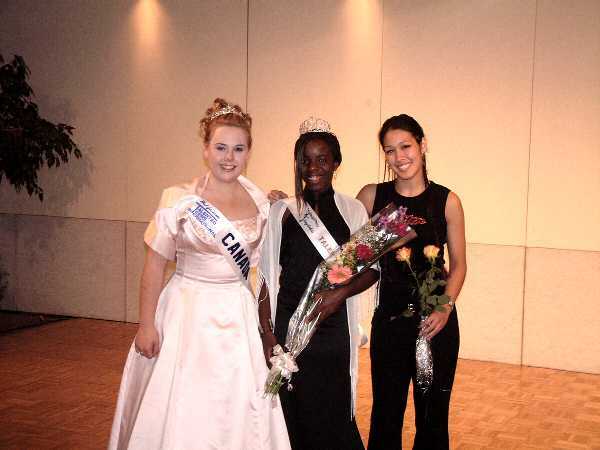 Performances by former teen participants were given by Melina Soochan, Miss Talented Teen Canada 2001, 1st winner of the Wilda LaBrie HJTTI Scholarship for academic excellence; Jamila Joseph, 2002, 1st runner-up and winner of the 2003 Black Theatre Workshop's Victor Philips Award; Leah McKesey, runner-up and subsequent performing arts scholarship winner. James Seely, guitarist, accompanied fellow Marianopolis student Melina Soochan on one number. The professional contributions made by Sule (voice and guitar) and Travis Knights (tap dancer) were quite riveting and added another dimension to the overall event. Finally it was time to call upon RapSohD's 2002 winner Vanessa Regnier to fulfil her last responsibilities as the reigning talented teen. This she did with her usual radiance and composure. Looking resplendent in her Miss Talented Teen Canada crown, HJTTI appearance dress and banner, she delivered a well-composed farewell speech and two songs - the first of which was At Last by Etta James, the second her winning number Testify to love by Wynonna Judd. 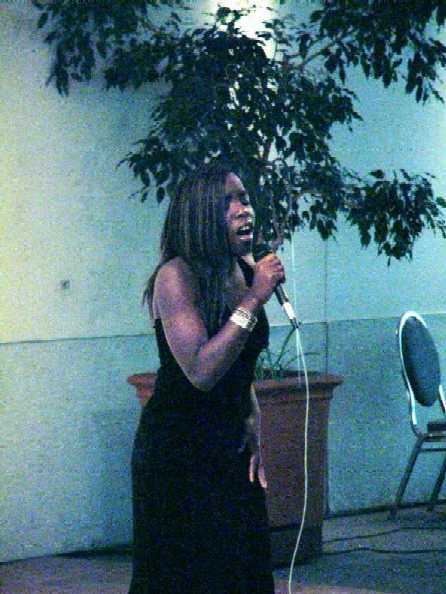 Her captivating sound was appreciated and applauded by everyone. 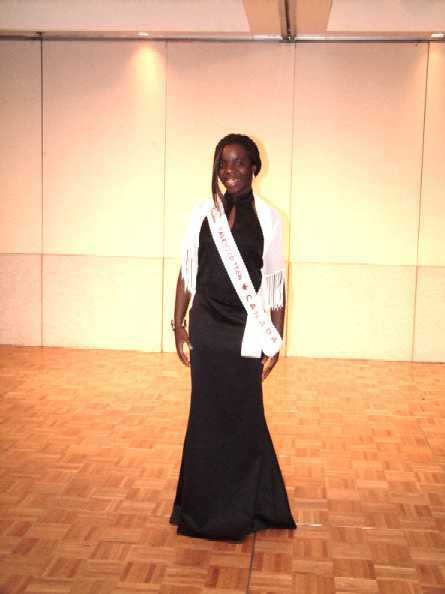 A final standing ovation was given to Vanessa who represented Canada, RapSohD and HJTTI with decorum and pride. RapSohD and its committee members extend congratulations and best wishes to her for continued success. An appearance on stage by Chris Lester, envelopes in hand indicated the impending announcement of the judges' decisions. After ensuring that all officiating persons were in position, the first envelope was opened and the name of the runner-up was announced. Thirteen-year-old St-Lazare resident Valerie Martin who danced to Flashdance by Irene Cara would be second to sixteen-year-old Montréaler, Mylène Otou. This high achiever of Pensionnat Du St-Nom-De-Marie wove herself into the hearts of the judges with a touching rendition of Hero by Mariah Carey. As she prepares to fulfil her responsibilities to represent Canada at the 33rd annual Hal Jackson's Talented Teens International performing arts scholarship competition, in St. Thomas, U.S.V.I. July 19 - 27, 2003, RapSohD, its members, supporters and all Canadians offer Mylène congratulations and best wishes for a positive and memorable experience. Welcome, Mylène! Goodbye, Vanessa and Melina!